The new project by Melodic Rock Records is called DEVOID. DEVOID is the brainchild of the French guitarist Mael Saout (Shadyon) who, in this debut, unleashes not only his technical skills (as a guitarist) but, also, some really outstanding songs and, at the end, he creates a superb slice of pure Euro melodic metal album that will be appreciated by any fan of this scene. In "Cup Of Tears" except Mael Saout we, also, find an impressive list of guests such as Mattias Ia Eklundh (Freak Kitchen - guitar), Henrik Danhage (Evergrey - guitar), Daniel Palmqvist (Beyond The Katakomb - guitar) and Magnus Karlsson (Primal Fear/The Ferrymen - guitar). On vocals we have Mr. Carsten Lizard Schulz ,who is well-known for his powerful vocal abilities, that makes the final result even more attractive. I think that the choice of Carsten Schulz was the perfect one for this record 'cause judging by the result his voice fits perfectly with the whole metallic sound of DEVOID and, as I already mentioned, he takes the final result to a higher ground. The opening tune of "Soldiers" kicks-off things here impressively with its heaviness and its power! A real melodic metal dynamite ready to blow up your speakers! "Collective Heart" is yet another interesting moment here; it's again a powerful track with heavy guitars, in-your-face vocals and when it comes to the chorus it transformers into a huge melodic hard rock gem! For sure one of the true highlights in "Cup Of Tears". The amazing and progressive "The Clock Is Ticking" (with its early Queensryche vibe), the epic "Religion", "Colours Fade To Grey" and the breathtaking instrumental "Hollow Point" are all four standout moments for me here. Whoa, DEVOID with this debut comes out of nowhere to offer us a really impressive and solid melodic metal album all the way. 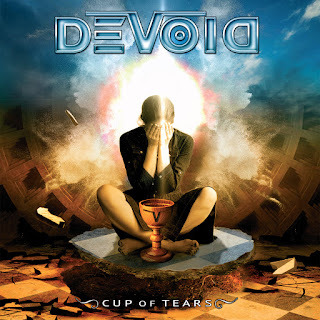 If you like your metal melodic, technical, catchy but, also, a bit progressive, then "Cup Of Tears" is your cup of tee!!! !